I Came, I saw.. I Macaron-ed. It was so dainty. So cute. But it was so bloody technical and taxing on my chubby fingers that I will probably never make another Macaron again. The only reason I was there, at The Cooking House, was because of the free voucher I got from the My Nourishment Magazine launch a couple of months back. So what makes the Macaron so darn special? 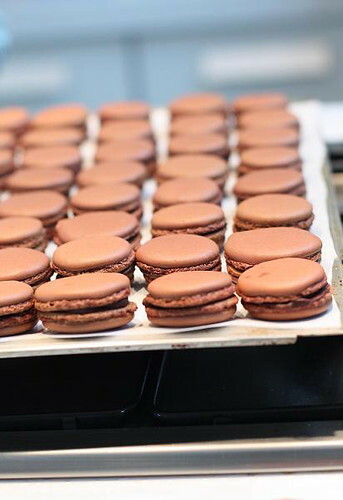 Like the cupcake before it, the Macaron, a French confection that resembles a pastel-colored sandwich cookie use to be so “indie” but is now entering the mainstream. If there was ever a Macaron craze, it is here and we are in the thick of it. So here I am, at the Cooking House. If not for the cajoling and encouragement from my good friend Fatboybakes (baker extraordinaire) and Chef Ryan K. (25 year old chef extraordinaire), I would never have gone for the class in the first place. So enjoy the “slaving over tiny french pastry dessert” photos, as this, is my labour of love! Believe it or not, the teacher said I had a pretty OK technique. Not bad huh? Well, did I enjoy my first class? Of course! Tremendously actually, because of the great company, the excellent teacher and my new found friends. Photos courtesy of my gorgeous and talented Japanese friend, Yasuyo, on my left(who incidentally has an excellent food blog called “Que sera sera Deco’s Diary”) and the handsome dude on my right is an energetic, talented guy, studying to be a Chef. HAHAHA, what a lurverly post. i previously wasnt a macaron fan, but natalie’s macarons were really top notch. actually, my memory must be failing me, i was looking thru my notes from the baking workshop at HTC, under Jean Francois, and he did teach us how to make lemon macarons. same method. i love macarons… but maybe not enough to attempt to make them myself. lol. great job! I am sure you can think of one you love so much!! You love me, dontcha? DONTCHA??? TQ! ya la.. my only claim to baking fame.. but don’t ask me to reproduce.. sure LEMAS one..
yasuyo is japanese la.. so her blog should be in characters la.. joker.. that’s why u cant read it! but don’t you think her photos are amazing?! hahaha.. plonk.. my EXACT SENTIMENTS! chubby fingers? oh dear god, i dunno how you want to describe mine..
macarons are so labor-intensive, but seriously I think the results are WORTH it. there was a macaron-craze in the US for awhile, where they came up with all these funky flavors from white truffles to hibiscus. I’ve always wanted to try the green tea one. that teacher of yours sounds so enthusiastic and passionate! I would love to have that kind of cooking teacher. btw, your macarons look perfect to me 🙂 would you ever make them again at home? You look as French as your teacher ! It’s a dream to do baking but not my forte. haha.. yes! all the time rite?! really? me french? wa… haha.. so dark. .summore slitty eyes, how to be french ..?! so i guess it is not worth the effort after all ? >.<"